You don't have to travel far to enjoy the culinary artistry of Executive Chef Bernard Guillas and his team. 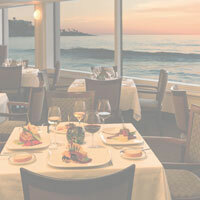 Explore the following masterful recipes from the best San Diego Chefs, from Hazelnut Dukkah Crusted Baja Prawns to Baked Leek Parsley Coated Halibut. Host an elegant dinner party in the privacy of your home and impress your guests with these chef recipes shared just for you. You won't have the high-tide views, but they will be here waiting for you. A tip from the Chef: Buy fresh and cook medium-rare.